TS several facilities including 2 years service in increments Gazetted rank For awarded Telangana teachers as per No.F-2-3/2018-NAT. Request for several facilities including 2 years service in increments Gazetted rank and for awarded teacher from state of Telangana as per No.F-2-3/2018-NAT. directed to forward a copy of letter dated 26 06 2018 copy directed of sree bookanna Srinivasa Rao founded and prevented awarded teacher Association District Khammam Telangana requested for providing several teachers including 2 years service moment order Increments Gazetted rank etc to Awarded teachers from State of Telangana. 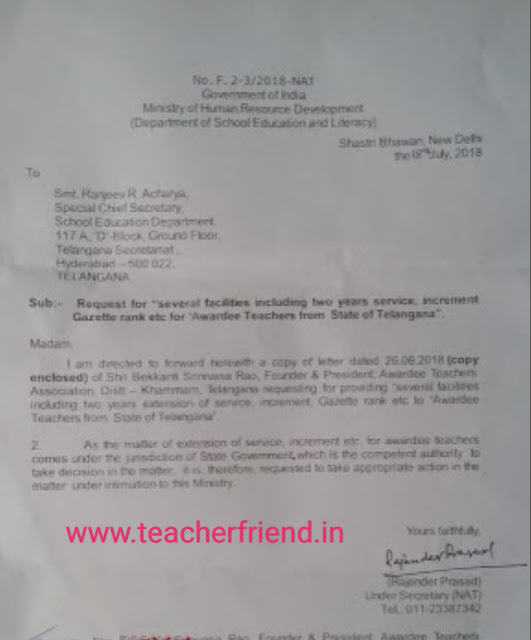 as the matter of existing of service increment etc are awarded teachers concerned order the direction of state government which is the corrupted authority to the decision in the month is therefore requested to the operations associated function in that under in under submission of the ministry.